Maple trees have many uses from being ornamental to being a valuable source of food and medicine. They are commonly used in commercial products, such as furniture and lumber. Maple syrup, which is native to North America, has been historically used as a natural sweetener the world over. It is obtained from the sap collected from certain Acer species, such as the sugar maple (Acer saccharum), the black maple (Acer nigrum), and the red maple (Acer rubrum). 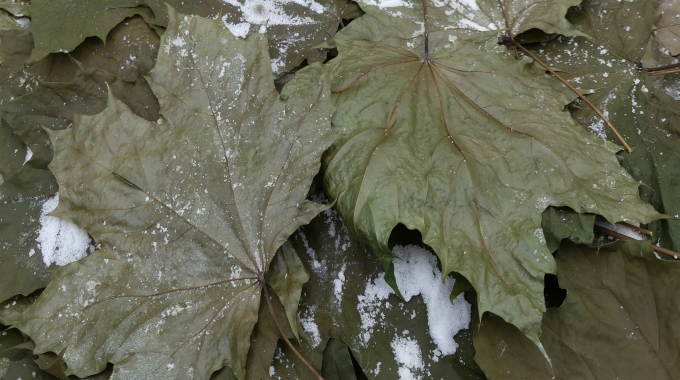 The leaves of many maple species are not only edible, but healthy for us. The chemical composition and pharmacological activities of this genus have been studied for years by many researchers. Many maple varieties have been found to contain a large number of phytochemicals and several beneﬁcial properties such as antioxidant, anti-tumor, and anti-inﬂammatory activities. Recently, the seed oil of certain maple species, such as the Norway maple (Acer platanoides) and the sycamore maple (Acer pseudoplatanus), was found to be a good source of gamma-linolenic acid, a dietary supplement beneﬁcial in treating a wide variety of human diseases, including cardiovascular diseases and cancer. Several maple species have been used in traditional medicine in East Asia (China, Japan, and Korea) and North America, such as Acer negundo, Acer pensylvanicum, Acer rubrum, Acer saccharinum, and Acer tegmentosum. Over the years, medicinal values of the maple genus have been shown to detoxify, treat rheumatism, bruises, eye disease, and pain. However, the traditional uses of maples have been recorded primarily in local herbal books or have been orally passed down from one generation to another. An incredible 331 compounds have been identiﬁed from thirty-four maple species. The compounds and extracts from these have exhibited a broad spectrum of biological and pharmacological activities, including antioxidant, anti-tumor, antimicrobial, anti-inﬂammatory, anti-diabetic, and hepatoprotective activities (protects the liver). To date, sixty-two ﬂavonoids have been isolated from the leaves and/or the stems of several maple species; this accounts for about one-ﬁfth of the total compounds. Flavonol, anthocyanidins, and ﬂavones represent the main types of flavonoids in many maple trees, mainly in the form of glycosides. Many ﬂavonoid glycosides containing galloyl have been isolated from the leaves of: Acer tataricum subsp.ginnala (amur maple), Acer rubrum (red maple), and Acer platanoides (Norway maple). They exhibit strong inhibitory activity against HIV-1 integrase. Among these ﬂavonoids, the anthocyanidins are responsible for the colour change of leaves in spring and in autumn. In the summer of 2017 I learned of a woman in Japan who ventures out every autumn to gather hundreds if not thousands of maple leaves. For over five decades, Setsuko Hisakuni has been making maple leaf tempura using yellow maple leaves because she says the veins are soft.er than other maple leaves. She, and others who help her gather leaves that have fallen to the ground, packs them with salt and lets them sit for one year. She chooses tempura batter because she adds a bit of sugar to add some sweetness. Each one is handmade because Setsuko takes pride in the work she does and giving customers a taste experience they will always remember. Setsuko says it brings her joy when she hears people say how delicious they are. 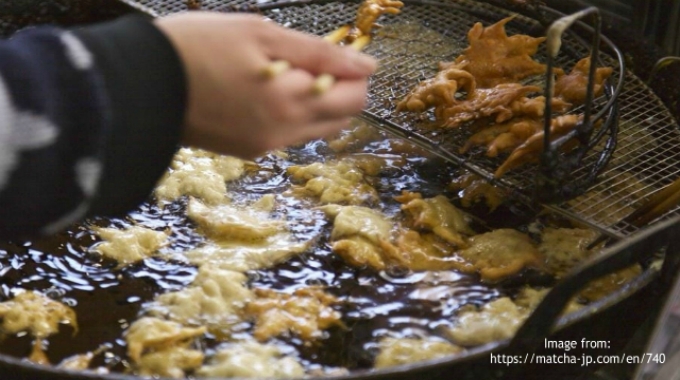 Maple leaf tempura is a traditional snack in Minoh City (located in Osaka Prefecture). Apparently this treat has been enjoyed by many since the 1300’s. You too can enjoy this incredible treat. Make no mistake, this will take time and it is worth it. When I learned of Setsuko Hisakuni I wanted to try this. However, gathering autumn maple leaves in southern Ontario is not anything I wanted to do. Far too many leaves have tar, or insect damage making the thought of eating them quite repulsive. So in June 2018 I ventured out and gathered many sugar, red and silver maple leaves from the trees while they were vibrant and healthy. In a very large, clean, plastic (storage) container, I put a fine layer of salt, then a layer of leaves. I continued with another layer of salt, then leaves, and so on until all my leaves were in the salt. Then I covered them with the lid (to prevent moisture from getting in) and placed the container in a dark, cool location for ten months. I decided to make a regular batter and a beer batter and both were successful. In addition, I tried simply deep frying plain leaves and ultimately created an incredible maple leaf chip. Garnishing the deep fried battered leaves can be as diverse as your imagination. With the maple leaf being synonymous with Canada, nothing says Canadian more than a deep fried maple leaf drizzled with maple syrup. 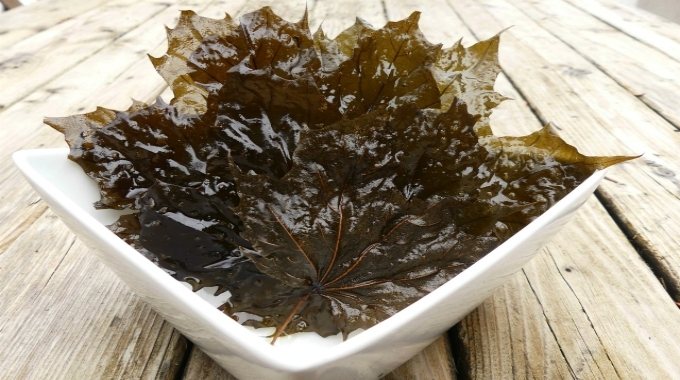 Making deep fried maple leaves is quick and easy – once you have preserved the leaves. Sadly, this part requires patience. Why preserve these leaves for so long? The leaves become the perfect texture to deep fry and it enhances the taste experience while maintaining much of its colour. The recipe I created can be found by clicking here. 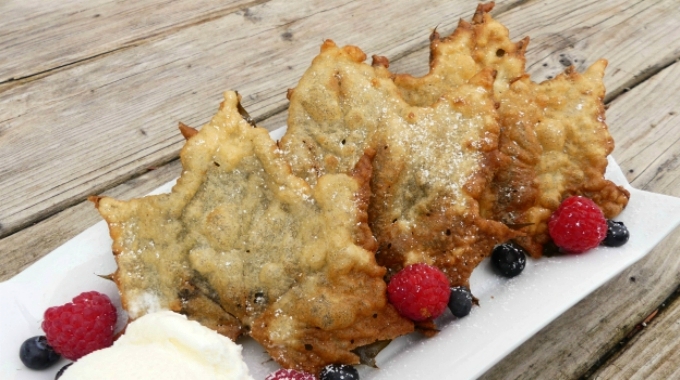 Once you eat a deep fried maple leaf, you will never look at the maple tree the same ever again! This year I’ll be out there gathering not only maple leaves, but other edible leaves as well such as birch, beech and others! Baydoun, Lamis, Dalleh, Helena, Arnold,and Nelly. Ethnopharmacological survey of medicinal plants used in traditional medicine by the communities of Mount Hermon, Lebanon. Volume 173, September 2015. Delendick, T.J. 1990. A survey of foliar flavonoids in the Aceraceae. Memoirs of the New York Botanical Garden. Vol. 54. New York Botanical Garden, New York. Shin, I.C., Sa, J.H., Shim, T.H., Lee, J., 2006. The physical and chemical properties and cytotoxic effects of Acer tegmentosum maxim extracts. Journal of Korean Society of Applied Biological Chemistry. Woo, E.R., Kim, H.J., Kwak, J.H., Lim, Y.K., Park, S.K., Kim, H.S., Lee, C.K.,Park, H.,1997. Anti-herpetic activity of various medicinal plant extracts. Archives of Pharmacal Research Journal Vol.20. Writing Group of Compilation of Chinese Medicinal Herb, 1996. Compilation of China’s Medicinal Herb. People’s Medical Publishing House, Beijing. Writing Group of Medicinal Plants of Zhejiang, 1980. Medicinal plants of Zhejiang. Zhejiang Science and Technology Press, Hangzhou. WHAAAA!!!! How amazing and I so have to get myself some leaves this spring. This is way cool!! THANKS for sharing!!!!!!!!!! You are welcome Joan! These certainly are well worth the wait! !